Optical images of the folding and unfolding behavior of the walking device. Inspired by origami, the ancient art of paper folding, Chinese researchers have created pre-programmed graphene-based paper that can self-fold into boxes, hand-like grippers, and even walking devices [Mu et al., Sci. Adv. (2015) 1, e1500533]. Folding and cutting two-dimensional materials is attracting new interest from materials scientists as an easy way of creating intricate three-dimensional structures. Graphene, with its exceptional strength, flexibility, electronic properties, and chemical stability, is the ultimate soft but strong two-dimensional material. The team cut out various shapes from a graphene-based paper that, when exposed to gentle light or heat, self-fold into three-dimensional shapes. The self-folding behavior can be programmed so that devices fold and unfold repeatedly to mimic walking and can even be prompted to turn corners. 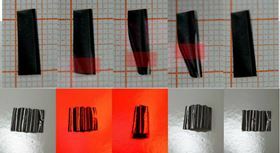 The self-folding behavior is down to the construction of the graphene paper. The paper consists of reduced graphene oxide (rGO) and polydopamine-modified graphene oxide (PDA—GO) layers, which react differently to water. PDA—GO is extremely sensitive—changing in volume when it comes into contact with any moisture—which can be controlled by temperature or light. By contrast, rGO is inert to water. To exploit this difference in behavior, the researchers created patterns of PDA—GO lines on rGO film using a mask-assisted filtration process followed by chemical reduction. When exposed to moisture, the differential absorption/desorption leads to a mismatch in expansion and contraction between the PDA—GO and rGO regions, inducing changes in volume that produce bending (or unbending). The researchers’ walking device is fabricated simply from parallel PDA—GO lines patterned on rGO and controlled by a near infrared (NIR) laser. When illuminated, the device stretches out and folds up when the light is turned off. By cleverly constructing the shape of the device, it can be made to move along as it folds and unfolds. Simply irradiating one side of the device asymmetrically prompts the device to turn. The simple nature of the device makes it efficient and quick to respond to external stimuli or controls. And even after repeated testing, the researchers found little degradation in performance. Wang believes that further development of the concept will lead to next-generation industrial mechanical actuators and self-folding devices for wireless remote control microrobots, microfluidic chemical analysis, tissue engineering, and artificial muscles. The technology could also be transferred into ‘smart’ clothing or responsive solar cells. ‘‘Our work has successfully overcome a number of practical problems including poor stability, nonphysiological operating conditions, and complex preparation technology that traditional active materials/actuators are still facing,’’ says Wang. There has been an explosion in interest in materials that can be designed to respond in specific ways to external stimuli, adds Christian Santangelo of the University of Massachusetts at Amherst. ‘‘Ultimately, this means these materials will be cheaper, easier to program, perform complex tasks, and quicker to respond to stimuli. But as well as bringing us closer to that future, I am excited by the fact that in this work the authors have a designed a device that can walk and turn,’’ he says. The team now plan to explore how nano-sized, few-atom layer origami devices behave.